The Ninth Circuit, in an unpublished opinion, held that plaintiffs in a securities fraud class action failed to meet the PSLRA’s heightened pleading requirements where the complaint did not contain factual allegations sufficient to demonstrate that the Defendants’ statements regarding a marketing initiative were untrue. In re Jones Soda Company Securities Litigation, No. 09-35732, 2010 WL 3394274 (9th Cir. Aug. 30, 2010). Plaintiffs appealed the dismissal of their securities fraud class action against Defendants Jones Soda Company and its former Chief Executive Officer, Peter M. van Stolk. Id. *1. Plaintiffs alleged that Defendants misled investors by overstating their efforts and accomplishments as Jones Soda entered the carbonated, canned soft drink market, leading to an over-valuation of Jones Soda’s stock. Id. The trial court dismissed the first amended complaint and denied Plaintiffs’ motion to file a second amended complaint. [P]laintiffs “must allege: (1) a misstatement or omission (2) of a material fact (3) made with scienter (4) on which [the plaintiffs] relied (5) which proximately caused their injury.” DSAM Global Value Fund v. Altris Software, Inc., 288 F.3d 385, 388 (9th Cir. 2002). Further, plaintiffs must “specify each statement alleged to have been misleading, the reason or reasons why the statement is misleading, and, if an allegation regarding the statement or omission is made on information and belief, the complaint shall state with particularity all facts on which that belief is formed.” 15 U.S.C. § 78u-4(b)(1). In order to withstand a motion to dismiss under Federal Rule of Civil Procedure 12(b)(6), the complaint must, as to each act or omission alleged to violate the securities laws, “state with particularity facts giving rise to a strong inference that the defendant acted with the required state of mind.” 15 U.S.C. § 78u-4(b)(2). In sum, private securities plaintiffs must “plead with particularity both falsity and scienter .” Ronconi v. Larkin, 253 F.3d 423, 429 (9th Cir. 2001). Defendants never claimed that their investments were sufficient or adequate to ensure that the canned-soda initiative would be profitable. Plaintiffs mischaracterize the statements made by Mr. van Stolk; Defendants did not state that they would pay $30 million–or any particular amount–specifically to promote or distribute canned soda. 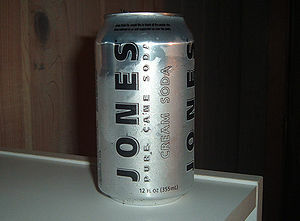 Indeed, Jones Soda incurred expenses related to promotion and sales in the carbonated soft drink market, which Plaintiffs acknowledge but claim were not enough to achieve Defendants’ goals. Plaintiffs failed to raise a strong inference that any of Defendants’ statements regarding their efforts to maximize Jones Soda’s share of the carbonated, canned soft drink market was false, as distinct from overly optimistic. Faulting a company for poor business decisions does not equal scienter, either. Plaintiffs must “specify facts or evidence that show why the statement [s were] false at the time [they were] made.” Id. at 431. Apart from Plaintiffs’ series of conclusory allegations that Defendants knew or recklessly disregarded the falsity of their statements, Plaintiffs point to a single fact from which they infer scienter: Mr. van Stolk allegedly received certain sales data from major retailers. The proposed complaint does not say what sorts of data were included in the reports, or which retailers the data covered. This single factual allegation is not sufficient to create a strong inference that Defendants deliberately misled their investors. Before Circuit Judges Reinhardt, Graber, and Paez. Circuit Judge Reinhardt dissented. Appeal from the United States District Court for the Western District of Washington, Chief District Judge Robert S. Lasnik. Steve Berman, Craig R. Spiegel, Erin K. Flory, Hagens Berman Sobol Shapiro LLP, Seattle, WA, David A.P. Brower, Brower Piven, New York, NY, Lewis S. Kahn, Kahn Swick & Foti, LLC, New Orleans, LA, for Plaintiffs-Appellants. Douglas W. Greene, Barry M. Kaplan, Marissa Grimes Walker, Esquire, Wilson Sonsini Goodrich & Rosati, Seattle, WA, Daniel Wagner Turbow, Cheryl W. Foung, Esquire, Wilson, Sonsini, Goodrich & Rosati, Palo Alto, CA, for Defendants-Appellees.